Documentary. 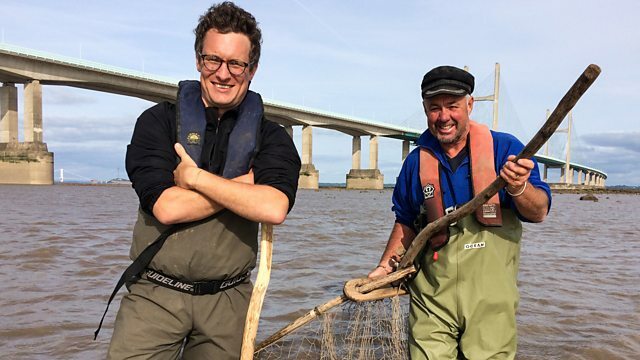 Writer and angler Will Millard embarks on the final leg of his journey down the River Wye, from Ross-on-Wye to Chepstow, where the river joins the Severn estuary. Writer and angler Will Millard is on the final stretch of his journey down the River Wye, as it meanders towards the sea and flows through an Area of Outstanding Natural Beauty. Will's first stop is in Ross-on-Wye, where hundreds of people have gathered to celebrate their connection to the river with a bit of friendly competition at the annual rowing club regatta. This stretch of the Wye valley is defined by steep-sided gorges lined with pristine woodlands, where people come to immerse themselves in the natural world. Tourism is big business on this part of the Wye, but the river plains and the rich lands beyond continue to support the valley's farming industry. Will visits a cider apple farm to taste the Wye's most famous fruit. There are many iconic landmarks on this stretch of the Wye, like Symonds Yat and romantic ruins such as Goodrich Castle. Artists and poets such as Turner and Wordsworth have been inspired by the Wye for centuries. At Tintern Abbey, Will attempts to paint a 'picturesque' masterpiece. However, beneath the picturesque cliffs and unspoilt woodlands hides the legacy of a forgotten economy. Will heads underground at a local coal mine to explore how the Wye was once a major trade route. As the Wye reaches the town of Chepstow, it becomes a tidal river joining the mighty Severn estuary. In these turbulent waters, a hardy group of fishermen still use a technique that dates back to the 16th century. Reaching the end of his journey, Will realises that this will be his last chance to see a wild Wye salmon and perhaps be the last person to witness this ancient fishing method.